You probably go to Starbucks when you need a caffeine fix. And you know a few cups won't kill you -- unlike this caffeinated drink. But which Starbucks drink gives you the most caffeine for the least amount of money? In a recent Reddit Q&A, a former 'Bucks manager revealed that it's the Starbucks Doubleshot. But be careful -- not all Doubleshots are the same. First of all, don't confuse the Starbucks Doubleshot on Ice you'd order from a barista with the one you see in convenience stores and supermarkets. This is super-confusing, because it's also a cold drink called the Starbucks Doubleshot. But here's the thing: There's not nearly as much caffeine in those cans (just 130mg). The Starbucks manager is instead referring to the Starbucks Doubleshot on Ice you'd get in the store, made fresh. "The Starbucks Doubleshot is cheap and potent," she says. "Iced coffees have a lot of caffeine and are cheap." She's not kidding -- the Doubleshot on Ice has 225mg of caffeine. That's a ton more than the Doubleshot served hot, which has a mere 110mg of caffeine. Keep in mind that an average 8oz cup of coffee has 95mg of caffeine. 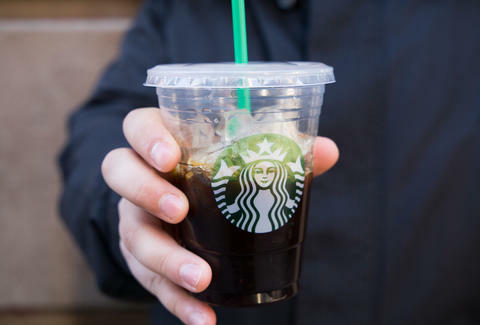 So you're getting two cups' worth of caffeine in one iced drink. If you want a delicious Starbucks drink but don't care about the amount of caffeine, we've tried every single drink on the menu and know what's best. Lee Breslouer is a senior writer for Thrillist and loves the Doubleshot. Follow him to caffeine highs @LeeBreslouer.